Christmas is getting closer and closer every day! I can’t believe we’re already almost at the end of the year. It’s crazy how fast the time has gone. You know we love a good free printable over here. We decided to round up some of the amazing free Christmas printables we’ve been seeing all over Pinterest! There are so many great ones – from printable Christmas cards to home decor, and gift tags to Santa letters. We also love all the printable games – great for keeping the kids busy. Elf is and always will be the best Christmas movie ever, and I WILL fight you about it. I love these Elf Christmas Cards from Bombshell Bling, they’re absolute perfection. Can I just say I’m loving this minimal trend that’s happening right now? These Minimalist Christmas Cards from the Beauty Dojo are so simple, yet still look so cool. I love the hand drawn look of these DIY Christmas Cards from Delia Creates. They are so simple but so pretty at the same time. No one will turn down a gift card at Christmas time, it’s the cold hard truth. These Gift Card Holders are a great way to add a personal touch to those people who might be impossible to buy for otherwise. Since we’re talking about gift card holders, these are just as cute, but a bit more hilarious! You have to check out these adorable free Funny Gift Card Sleeves. Give me all the reindeer prints! The Stork is Coming has created these amazing Reindeer Greeting Cards and they look so adorable. 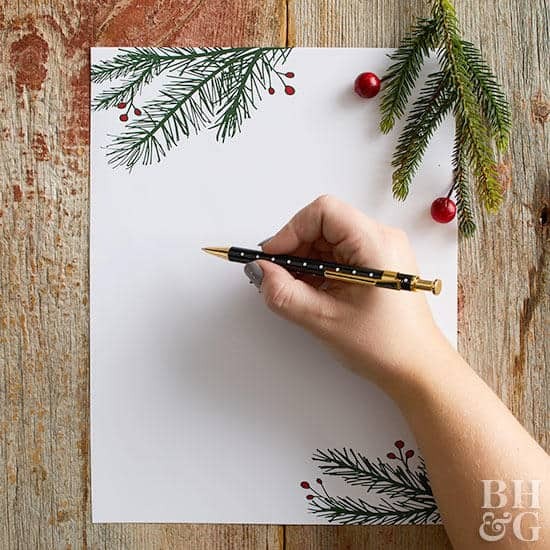 If you can’t be with your loved ones during the Holidays, send them a hand written letter on one of these amazing Christmas Letter Templates from Better Homes and Gardens. “Keep Calm” Posters are here to stay. We love this adorable spin on the classic with this Keep Calm and Snuggle Printable. As much as I love the sparkle and glam, I love having reminders in my Christmas decor about why we’re really celebrating. I love these Nativity Themed Printables because they help do just that. I love the idea of putting Christmas songs on the walls! It’s a great way to keep a song in your heart all season long. These Lyric Posters from Landeelu are so cool, and can be downloaded in multiple sizes. 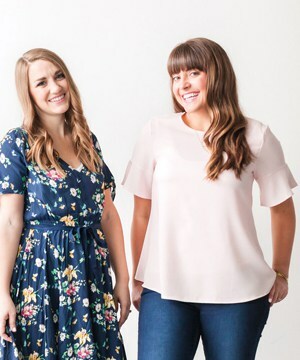 Girl a good geometric print looks good in anyone’s house, and these prints from Simple as That Blog are so amazing and adorable. They capture the perfect Chic Christmas look. Sometimes the best printable is just a simple one. 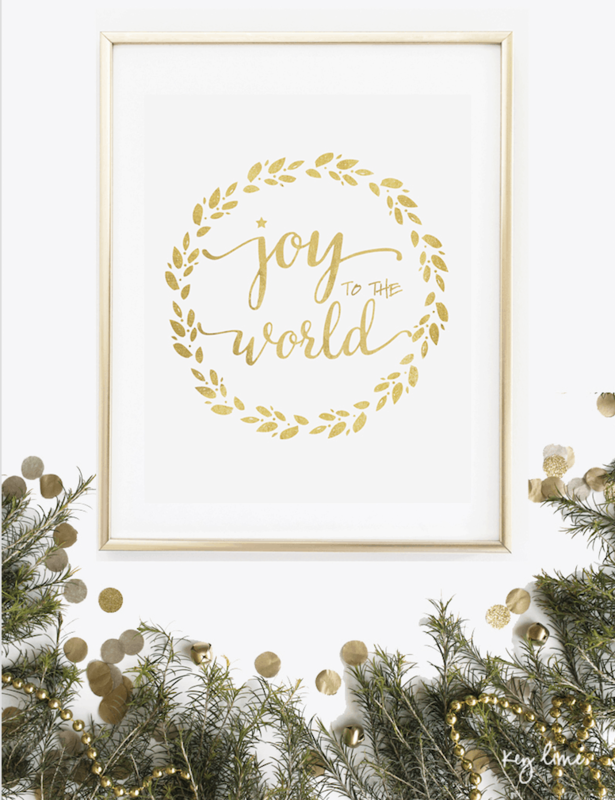 I love this plain gold Joy to the World Printable from Lil Luna. A good chalkboard print will never go out of style. I love this embellished Chalkboard Christmas Tree Printable from I Should be Mopping the Floor. A few years ago our friend Katie from The Shabby Nest created these awesome Printable Gift Tags for us and they are still as classic as ever. Are you that person in your neighborhood that passes out those coveted jars of homemade jam or caramel or whatever your specialty is? If so, you’re a way better neighbor than I am honey. I salute you. These Free Jar Labels are the perfect thing to add that Holiday flair to your homemade gems. These “Bright” Gift Tags are so cute and a great last minute Christmas gift idea if you need one. 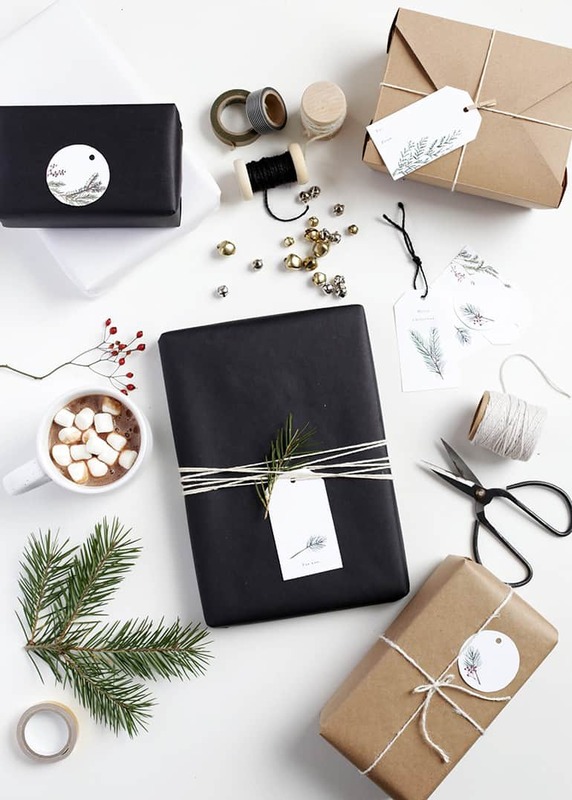 Ok, have you seen those cute Christmas gifts that are wrapped up with a little piece of a pine tree tied to the front of it? It’s adorable, but honestly, I’m not going to be cleaning up extraThe Merry Thought pine needles after Christmas morning. I’ll have enough cleaning to do. I love these gift tags from , they have little pine sprigs and holly berries all over them. So you get that adorable look without any of the hassle. 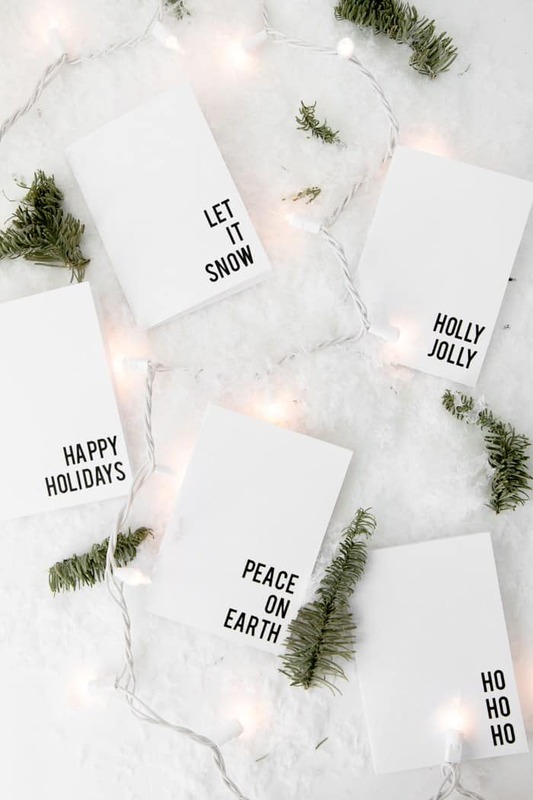 These gift tags from Live Laugh Rowe have huge graphic typography on them that you just have to see, they’re going to stick out from under your Christmas tree in the very best way. If you prefer a more hand written look, these Hand-Lettered Christmas Tags from Persia Lou are super cute. We love our Christmas Bingo Printable A great way to whip a fun kids game out of nowhere. I love the idea of a cute banner with a fun saying. Shanty 2 Chic has created the cutest banner, but she’s done it for the whole alphabet! So you can make your banner say whatever you please. The possibilities are endless, get it girl. What party isn’t complete without a PHOTO BOOTH!? Elegance and Enchantment has created these amazing Printable Christmas Photo Booth Props that are so easy to make and look great in photos.